White Bristle Marking brushes are produced using white bristle secured to a natural wood, easy-to-grip handle by a rustproof ferrule. The all natural bristle is set in epoxy for solvent resistance. 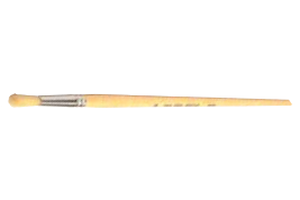 There are seven standard White Bristle Marking brushes available in various diameter, trim lengths and overall lengths. These brushes come in a pack of 12 units. These small-diameter brushes are ideal for stenciling, marking, detailing and touch-up done in the classroom, the photography studio or in fine art institutions.